Orchestral conductor and musical arranger Gerard Salonga will now have to shuttle between Kuala Lumpur and Manila for the whole of 2019, as he takes on a new job as resident conductor of the Malaysian Philharmonic Orchestra (MPO). 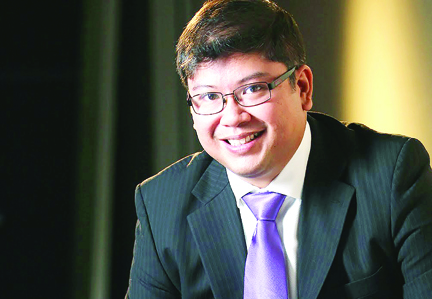 Gerard Salonga will have to go through a busy 2019, as he recently took on a new job to wield the baton for the Malaysian Philharmonic Orchestra. After working as assistant conductor of the Hong Kong Philharmonic Orchestra in 2016 and still currently for the ABS-CBN Philharmonic Orchestra, Gerard now wields the baton for the MPO. He learned about his new job in May 2018, while he was in Kuala Lumpur to conduct one of the concerts of the MPO. Gerard is thankful for his stint as assistant conductor of the Hong Kong Philharmonic Orchestra, with Maestro Jaap van Zweden as music director. It was towards the end of Gerard’s term with the Hong Kong Philharmonic when the MPO invited him to join them as resident conductor. He is truly excited that he is given a new opportunity to work with a diverse group of musicians at the MPO. Upon learning about the good news, Gerard immediately shared it with his wife, DJ Francisco Salonga, a NAMCYA awardee and an equally accomplished musician on her own. She plays the violin for the ABS-CBN Philharmonic Orchestra. The couple has been married for 14 years. “DJ is the person I talk about music with the most. She keeps me humble and always lets me know where I can get better,” Gerard shares. Gerard’s sister, Lea and his mom Ligaya were also told about the news. His mom’s usual advice to him was “to get enough rest, eat well and don’t let anyone push me around,” Gerard grants. The only thing Gerard had to deal with while in Kuala Lumpur, is being away from his two kids – Antonio, 11, and Carmen, 8, a lot. “It’s very hard, really – while I’m away from them,” he attests. Yet, he is looking forward to DJ and the kids spending the summer vacation with him in Malaysia and Hong Kong. “For future seasons, I will need to intelligently fix my schedule between ABS-CBN, MPO and other conducting engagements,” he says. Aside from conducting the MPO this year, Gerard also has schedules to lead the Hong Kong Philharmonic this March, Kunming Nie-Er Symphony Orchestra in May, South Denmark Philharmonic Orchestra in August and Sydney Symphony Orchestra in November. Gerard will also work with an orchestra for theater productions like Sweeney Todd for Atlantis Theatrical in Manila (October) and Singapore Repertory Theater (November-December).